The University of North Georgia Press is pleased to announce the release of our first children’s book entitled UNG The Gold I See: The Legacy of UNG’s Dahlonega Campus written by Dr. Bonita Jacobs and out November 27, 2018. While written for readers at Level 4, UNG The Gold I See engages readers of all ages, reflecting its multi-generational main characters. Benjamin Smith, his daughter Jamie, and grandson Tommy each have a different goal during Visitor’s Day at UNG Dahlonega’s Campus. The grandfather wants to recall the memories of his years in the Corps of Cadets. The mother wants to remember her years in the nursing program. And the grandson wants to find UNG Dahlonega’s treasure: the gold hidden somewhere on campus. He has Nigel and a treasure map; his grandfather and mother have the memories. What do you have? The author, Dr. Jacobs, is president of the University of North Georgia. Among her many initiatives at UNG, Dr. Jacobs’ scholarship support for students has been a major priority. All profits from UNG The Gold I See will be used to provide scholarships to UNG students across all five campuses. This is the first book in a series about each UNG campus. UNG Gainesville will be the second book in the series, out in 2019. Dr. Jacobs took office as the 17th president of North Georgia College & State University in July 2011 as the University’s first woman president and only the second to lead one of the country’s six Senior Military Colleges. In 2014, Jacobs was named as one of the “100 Most Influential Georgians” by Georgia Trend magazine and as one of the “Top Education Leaders in Atlanta” by the Atlanta Business Chronicle in 2013 and 2014. 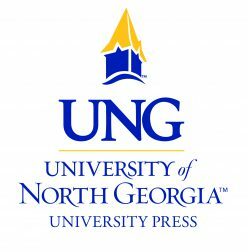 The University of North Georgia Press, a scholarly, peer-reviewed press, is an extension of our sponsoring university, the University of North Georgia. Our primary function is to promote education and research with a special emphasis on innovative scholarship and pedagogy.